The terms “mass-produced” and “handmade” are, in many ways, polar opposites. It’s difficult to scale handmade products, as production can’t be increased simply by investing in capital (i.e., manufacturing space, machinery, etc.) Scalability, especially in markets that require a large amount of specialization (like pen-turning), is reliant upon the number of hours in the day, the number of people you can hire with the skills to do the work, and how productive they can be. As a result, most handmade products are extremely expensive, and most inexpensive products are mass-manufactured. Somehow, many Indian pen makers have figured out a way around this conundrum. They put out a significant number of moderately-priced items in a relatively short period of time. When it comes to handmade items, it is fair to say that, in most cases, quality suffers by ramping up the speed of production. Usually, doing so requires spending less time on the final steps of finishing. It’s the ninety-ninety rule: The first 90% of the work takes 90% of the effort. The last 10% also takes 90% of the effort. One manufacturer that consistently seems to be able to straddle the line between production speed and quality better than most is Ranga Pens and its sole owner and penmaker, Mr. M.S. Pandurangan. In the video above, you can watch Mr. Pandurangan at work creating a pen by hand. Of the Indian brands, Ranga has consistently been my personal favorite. So, when US retailer, Peyton Street Pens, began working with Ranga to retail Ranga pens (and with Jowo nib units!) I was excited. Even more recently, Peyton Street Pens has collaborated with Ranga to come up with a new model that is exclusive to PSP called the Zayante. 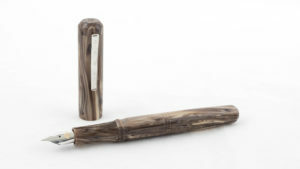 The Zayante, like most hand-made pens, is on the large side. 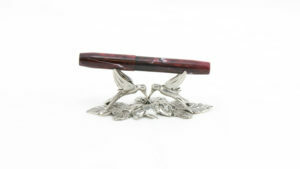 (I suspect that hand-shaping a small pen is particularly difficult, which is why so many handmade pens are large.) 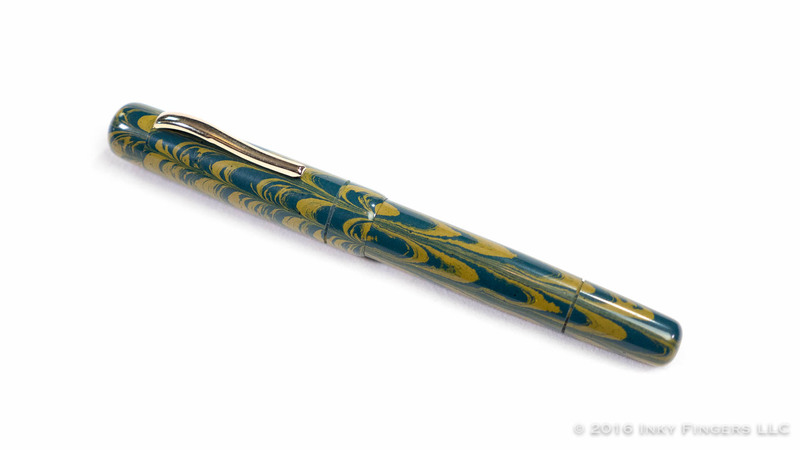 The pen comes in ebonite or acrylic in a wide rainbow of colors. 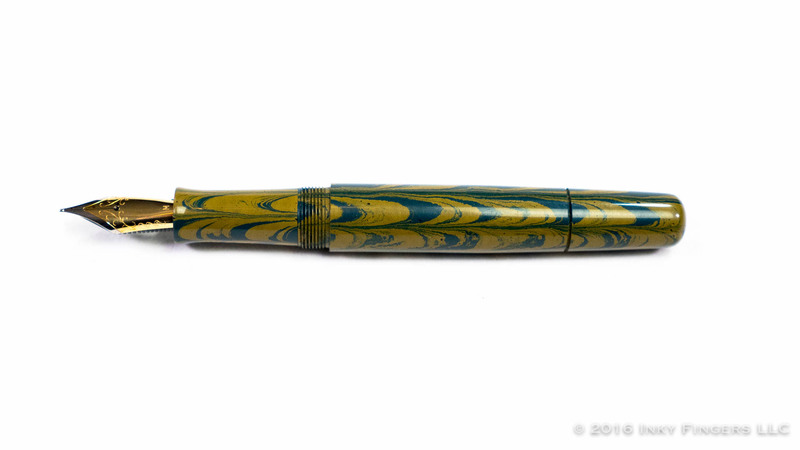 For this particular pen, I wanted to branch out a bit and try the yellow and blue ripple ebonite. The figuring on the ebonite is spectacular, but the colors were just a touch more muted than I was hoping for. I found the ebonite itself to be of good quality. There weren’t a lot of inclusions, pits, or air bubbles in the material. There were some dark color specs throughout, but they are well-integrated into the material. Perhaps more importantly, though, the finish work on this pen is of higher quality than many high-volume handmade pens I’ve come across. The surface of the ebonite sanded perfectly smooth and is highly polished. 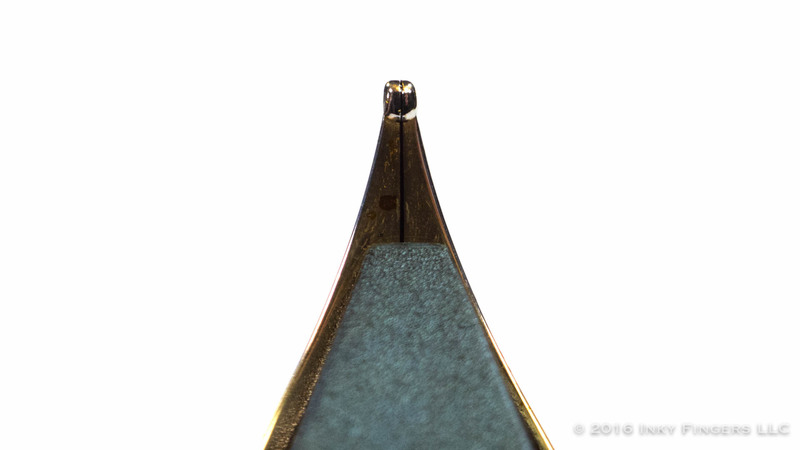 The join between cap and finial is nice and tight, although the pattern doesn’t quite match up and there is a little tiny lip between the parts on one side of the pen. The cap features a tall finial that is rounded, but with a very flat dome. There is a small slot cut in the lower portion of the cap into which the clip is attached. 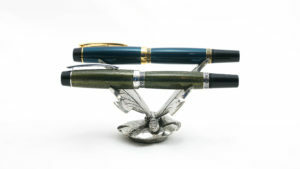 The pen can come with either gold or silver-colored hardware. The rest of the cap is free of decoration, save for a groove cut into the ebonite toward the bottom of the cap where a metal cap band might normally sit. The barrel features clean lines and is relatively unadorned. It’s made from a single piece of ebonite, and again there is a groove cut into the barrel to give the appearance of a finial. 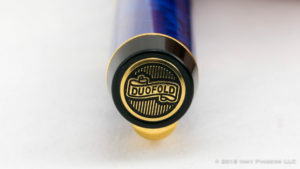 The end of the barrel features that same domed end that straddles the line between rounded and flat. The cap unscrews from the barrel with 2 1/2 turns on smooth threads. At several points in the video above, you can watch how the threads are cut into the material. Mr. Pandurangan does it by hand, which, I must admit, completely baffles me. How the threads fit so well together when cut by hand is rather astonishing. This pen came with a #6 Jowo bi-color steel nib in Medium. 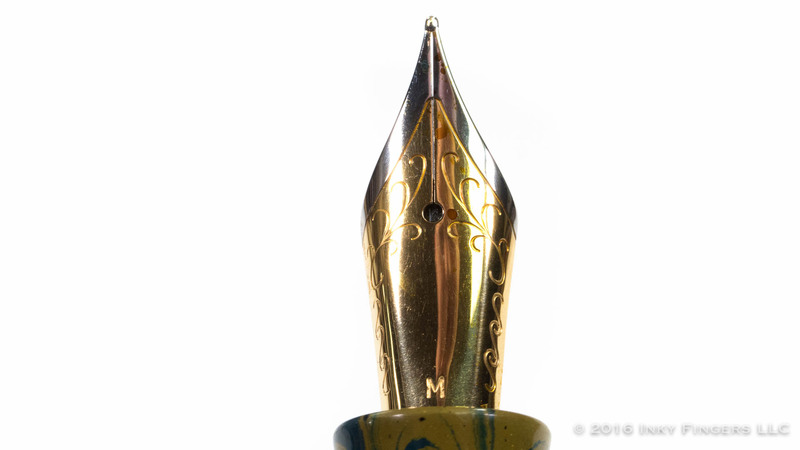 The nib doesn’t have any decoration beyond the standard scrollwork that normally comes with Jowo nibs. 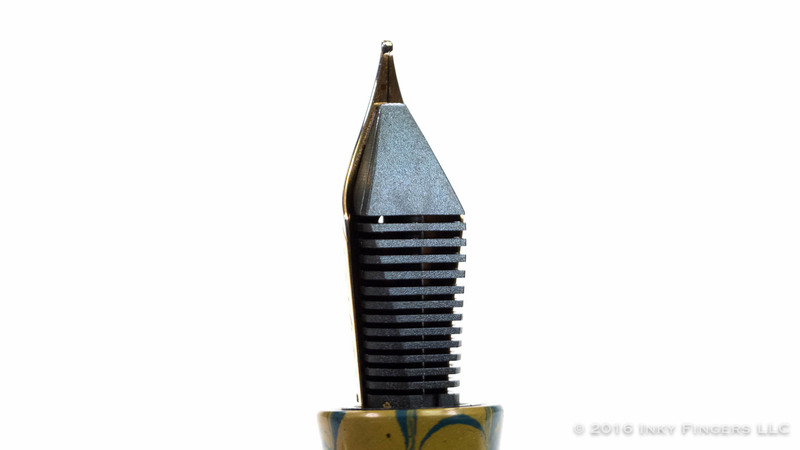 Like most Jowo steel nibs, the nib on this pen has a medium-low amount of feedback and a nice, moderate ink flow. It’s a very rigid nib, though, so don’t expect much in the way of line variation. Being a #6 Jowo nib, it can also be replaced by a whole variety of options, including some from other pen manufacturers. 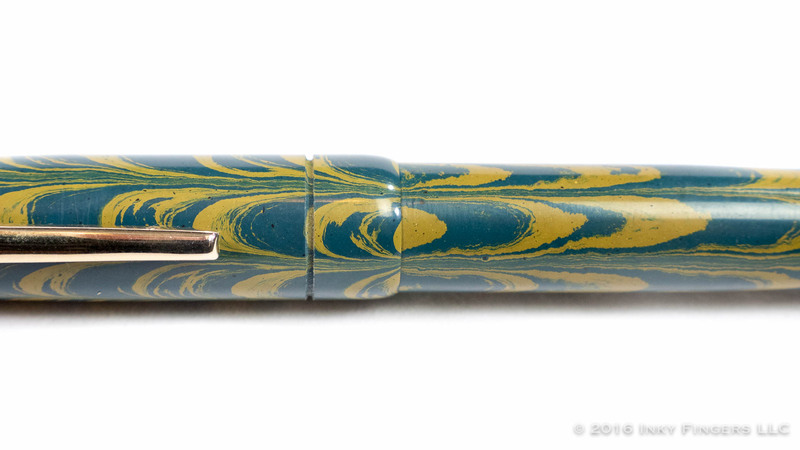 In fact, if you have a gold nib from Franklin-Christoph (for example), you can even order the pen without a nib or converter and save yourself $20. 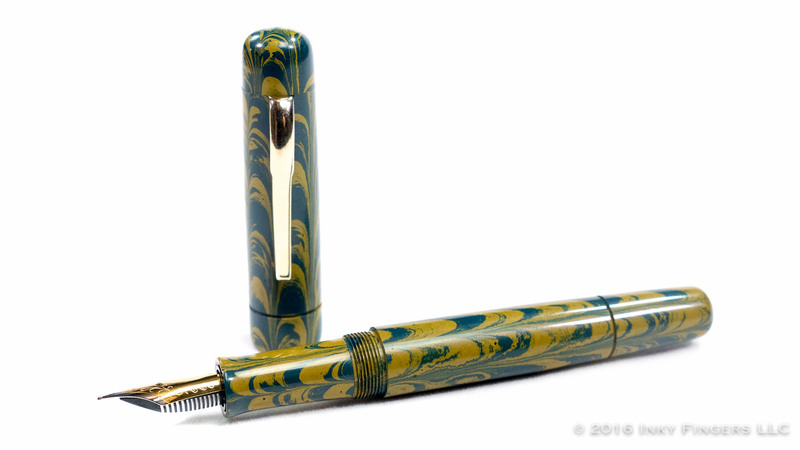 With its all-ebonite construction, the pen is a perfect candidate for eyedropper conversion. The threads between the barrel and the section are tight and smooth, and do a great job keeping the pen from leaking with just a touch of silicone grease. When ordering the pen from Peyton Street Pens, Teri is kind enough to include an instruction sheet about how to eyedropper the pen as well as a bit of silicone grease to get you started. It’s a nice addition that a lot of eyedropper-compatible pens don’t include. 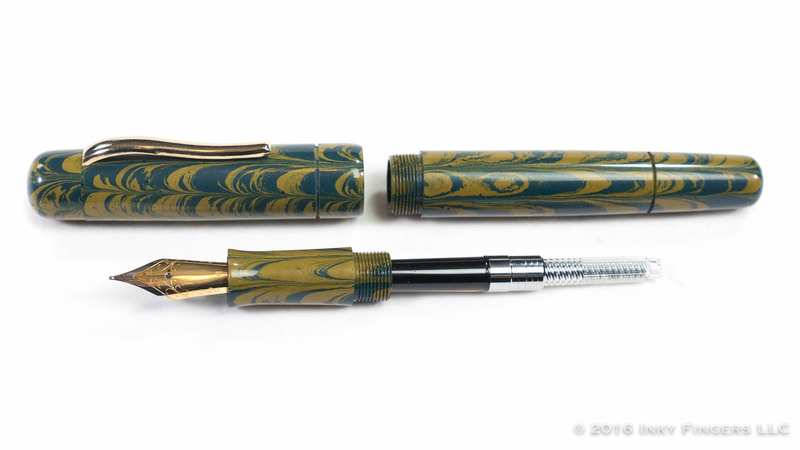 The Peyton Street Pens / Ranga Zayante is a really affordable option for exploring handmade ebonite pens. Ranga is, in my mind, one of the best manufacturers occupying this space between mass production and handmade custom pens. And, at $72 ($87 if you go for one of the “premium” materials), you can have an attractive, well-made pen that fits comfortably in the hand writes well and has the potential for a massive ink capacity. I feel like the Zayante would be a good value on its own, but when you compare the materials and quality of manufacture to others pens in the same price range, this makes for a very interesting alternative to more mass-produced options. This pen was provided free of charge to The Pen Habit by Peyton Street Pens in exchange for an honest review. All opinions expressed herein are my own.